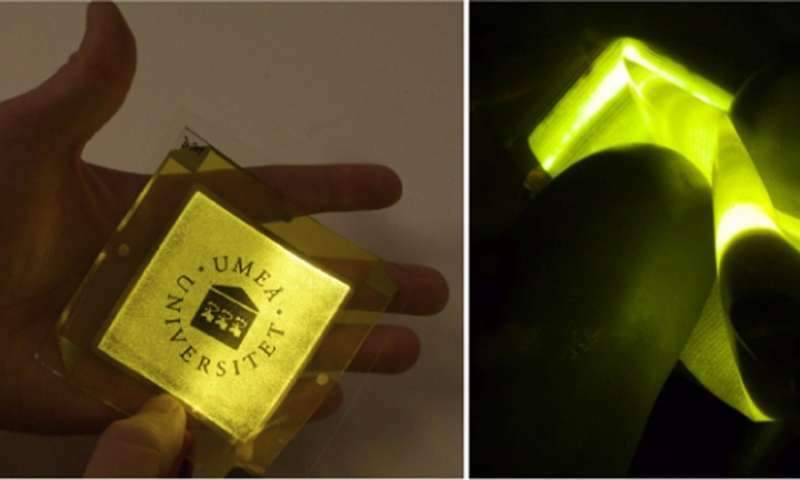 (Tech Xplore)—Researchers have fabricated a large-area textile that emits bright yellow light for more than 180 hours. The low-cost, flexible, transparent textile has potential applications in light-emitting clothing, signs, and architectural features. The scientists, led by Ludwig Edman, a professor in the Organic Photonics and Electronics Group at Umeå University in Sweden, together with researchers of LunaLEC AB and sefar AG, have published a paper on the light-emitting textile in a recent issue of Flexible and Printed Electronics. "Our work shows that ultra-flexible light emission on large areas can be realized on very lightweight textile electrodes," coauthor Thomas Lanz at Umeå University told Phys.org. "Traditionally, this was hard to come by, as these electrodes are typically quite rough. We have demonstrated that the light-emitting electrochemical cell's inherent fault tolerance is ideally suited for this type of transparent substrate. We see great potential for this technology in the field of wearables, as the device is highly conformal." As the researchers explain, the key advantages of the new fabric are its high flexibility, light weight, and low cost. Currently, the most common transparent and flexible light-emitting device technology is the organic light-emitting diode (OLED), whose fabrication process involves expensive vacuum technology. In addition, the transparent electrodes in many OLEDs are made of indium-tin oxide (ITO), a relatively scarce material that is expensive to use on a large scale. In contrast, the light-emitting textile presented in the new study is realized by spray-coating a light-emitting electrochemical cell (LEC) onto a transparent fabric-based electrode, resulting in a simpler and less expensive fabrication process compared to that used to make OLEDs. The fabric electrode consists of a weave of silver-coated copper wires and polymer fibers that are embedded in a polymer matrix, all of which is coated with a conductive ink. 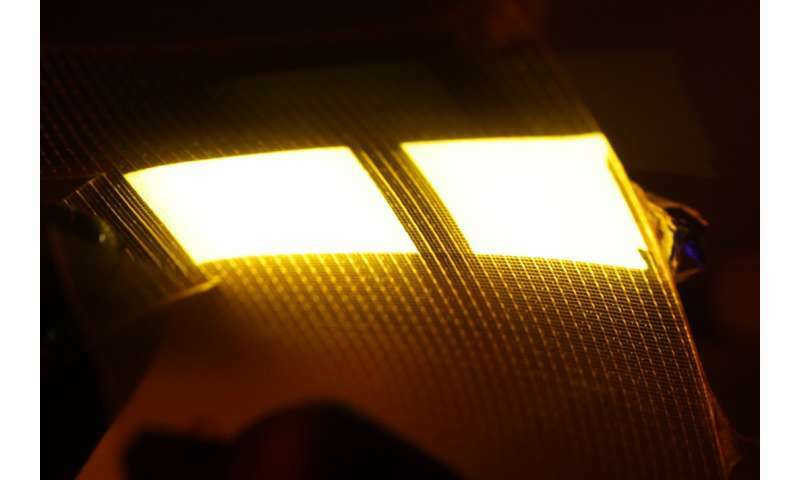 Tests showed that the new textile emits highly uniform, bright yellow light for more than 180 hours, with the efficiency and luminescence both increasing over time. The researchers attribute these characteristics to the dynamic doping process that renders the LEC highly fault-tolerant. In the future, the researchers plan to scale up the device to cover even larger emission areas and to make it semi-transparent, both of which look promising due to the flexible fabrication process.